Q: You broke the school record in the triple jump at your very first college track-and-field meet. Did you plan on introducing yourself in that way? A: It was my first jump too! It was a little bit of a surprise, but when I broke the record, it wasn’t actually my personal record. So I wasn’t really satisfied with myself because I’m always competing against myself—pushing myself to be better. But my teammates were going crazy. I mean, I’m happy I broke the record, but it wasn’t my personal best. Q: How long have you been competing in track-and-field? A: Since seventh grade, but you could really say I’ve been running longer than that. My dad used to have me running hurdles when I was 7 or 8 years old, but my main passion was football. My dad really wanted me to go to the NFL. I thought I was going to go to the NFL. When I was in tenth or eleventh grade, though, they started telling us that only 10 percent of athletes go to college to play football and only one percent make it to the NFL. Plus I’ve had so many concussions. My mom told me I needed to stop playing football and start focusing on track because I was good at it. Q: It seems like mom was right! A: (laughs) Yeah…a little bit. A little bit. But even now sometimes, I think that I want to play football. But I made an agreement with her. I had a concussion my junior year of high school. My coach told me I needed to get tested before he would let me play football my senior year and that my mom had to sign a waiver. When she found out how bad concussions are, she really wanted me to stop playing, so she made an agreement with me. She said, ‘If I let you play your senior year, you can’t play football in college.’ I agreed because it was my senior year! That’s your biggest year. A: Never in my life had I been to Indiana, but I liked it. I went on a few other visits back in Texas, but there definitely was something special about this school. Everything is bigger in Texas, and I had wondered how people went to colleges where there are 200 students in a classroom. You can’t really connect with your teachers. During my visit, I only talked to Coach Morgan for about 30 minutes—the rest was hanging out with other athletes. It was really them who persuaded me into coming here. Q: How is it going for you so far? Beyond track-and-field, that is. A: I made the Dean’s List my first semester. That was pretty cool. I’m doing the dual degree program for mechanical engineering, so it’s going to be tough every semester. I’m going to try to keep my 3.5 GPA and hopefully make the Dean’s List this semester, too. Q: Is that what you want to do? Become a mechanical engineer? A: I’ve always liked making stuff with my hands, and I took some engineering classes in high school. People have told me how hard this program is, but I think as long as you put your mind to something, you’re going to accomplish it. I’m dedicated to my dream of being a mechanical engineer, so I’m gonna push through. Q: How do you think you’ll go about keeping all of this success going? In the classroom or on the track…you’re only a freshman. A: My main goal for school is to get that degree. My mom is the one who motivates me and is the reason I’m here. I want to come out of this being successful, being able to buy her things. Other than that, I also want to meet and connect with new people. That’s really important—getting a lot of contacts in your phone because that’s how you get jobs. That’s one thing an alumnus told me when I first came here. As for the triple jump, I’m ranked No. 1 in the conference, but there’s a lot of pressure at the national level. And if I’m not first, I’m last. That’s how I think about it. The support of my teammates will help keep me going, but really it’s all mental. I gotta keep my mind to it. I gotta keep pushing. Favorite song to warm up to? I really just throw on a playlist, but it’d have to be something by Drake. Favorite class you’ve taken at Wabash so far? I’d have to say Chemistry. I always liked science, and chemistry was different in college. We got to do a lot more hands-on things than I got to in high school. Favorite thing to do during your free time? 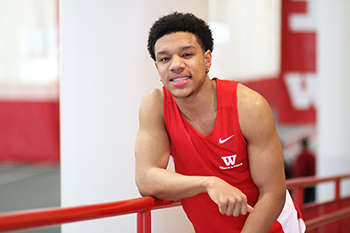 Preston Whaley ’22 will be competing in the triple jump and the long jump this weekend in the North Coast Athletic Conference Indoor Championships.